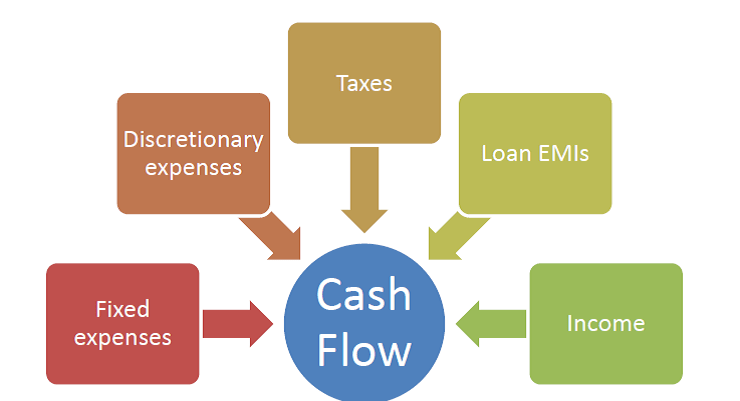 Home Cash Flow Planning Why personal cash flow analysis is important for financial planning? Personal Cash flow management is a boring job, do you agree? It’s quite difficult to dig deeper into the expenses to figure out your complete cash outflow, just to find out if your spending structure is good for your financial future or you have to cut down on that. Moreover, when cutting down on spending, itself is very depressing thing. Sometimes personal cash flow analysis is also embarrassing for those who think that they are careful in spending, but after taking a closer look also finds places to trim some fat. This is why many of you avoid getting into this exercise and just want to know where to invest, why to invest, when to invest and for whom to invest. The word financial planning sounds very boring, but Investing is exciting. You think that the path to achieve goals is only through investments. and in search of perfect investment portfolio you ignore the rules of the game. Cash flow is the blood line of any financial process. Can you imagine your employer be in a position to pay you regular salary if the cash flows are not being managed properly? What was the problem with Kingfisher airlines? They were too much into debt, and revenues were slowly coming down. Unnecessary spending was on rise, and when banks stop the restructuring of loans, the bomb exploded. Same could happen in personal finance if you don’t have control on your personal cash flows. It’s not only about creating and following budget, but also to understand the pattern of spending and sources of income, the areas to improve on. Personal Cash flow understanding helps in goal settling, it prepares you for uncertain times …and so on. Goal settling: What is Retirement Planning? It is about managing your current finances and investing the surplus generated in such a way so you can accumulate a decent amount, to lead you to comfortable post-retirement years when you will not be getting monthly income. At that time your savings will be your only source of income generation. Now, do you think that just giving a numerical figure to this goal justifies the planning, of course not? Your Monthly/Annual basic plus lifestyle spending will lead to one figure to achieve, but staying intact with the same figure, also needs a regular cash flow review. In fact regular cash flow reviews are important post retirement also, so you should be abreast with your spending limits. To save towards your goals, you need to have enough money available with you for investments and for that too, cash flow understanding is must. If there’s not enough money then either you have to rework on your goals or have to generate enough surplus by following a budgeting technique and both involves personal cash flow understanding. This is not all, while on the way to retirement you will meet so many other goals, desires/wishes and unexpected expenses like Annual vacations, Children education & Marriage, Buying new house , Changing car every 4-5 years, House repairs, House furniture replacement, Medical emergencies, Close relative marriage etc. To achieve your long term goals, you need to manage your day to day spending structure to stay planned for most of the things. Asset purchase and Debt management: Having own house or new car has always been one of the most important or thrilling goal for many of you, but buying it on loan needs the understanding of your cash flow position. Though banks will look at it from the repayment capacity of the borrower, financial planning along with will also look on the impact it will bring on other goals too. Debt management and goal planning go hand in hand. Insurance Planning: A proper back up plan is as important as a sound and stable investment plan. Many of you must be having number of insurance policies in your portfolio, but are not sure of the adequacy of insurance cover in that. Some of you have also been bought those policies with a view of saving for future and thus major portion of your cash surplus would be going into those products. Without commenting on the type of products you have bought, what is important for you to understand is the Insurance cover being offered collectively by all those policies. Here again your cash flow analysis will play its part, as to find out the adequate insurance cover, one needs to have a clear idea on the spending pattern, loans taken and Goals targeted. When your personal cash flow is positive and you can afford to build surplus, then you can have emergency fund to fall back on in case of unexpected event. You will be in a position to pay in cash for your purchases instead of swiping credit cards and rolling it over. And also you would be in a position to seriously work towards your financial goals. But on the other side if you are cash flow negative then I don’t think any of your investments towards your goals can stay intact. You will run after returns and look out for ways to make more money in short period of time. Following a process would be next to impossible as you may require money at any point of time. The bottom line is personal cash flow management is an integral part of financial planning. Getting hold of your personal cash flow is like half the battle won for a better financial future. When was the last time you did your personal cash flow analysis? Do you agree that its important to have understanding on one’s cash flow. Thanks sir for such a valuable information! I totally agree with what you said. I think that when we have a positive cashflow either it’s personal or business cashflow we’ll be able to have a money that we can get for emergency or unexpected incidents. Thanks for sharing this article.